This holiday season, light up your greetings with light, literally. 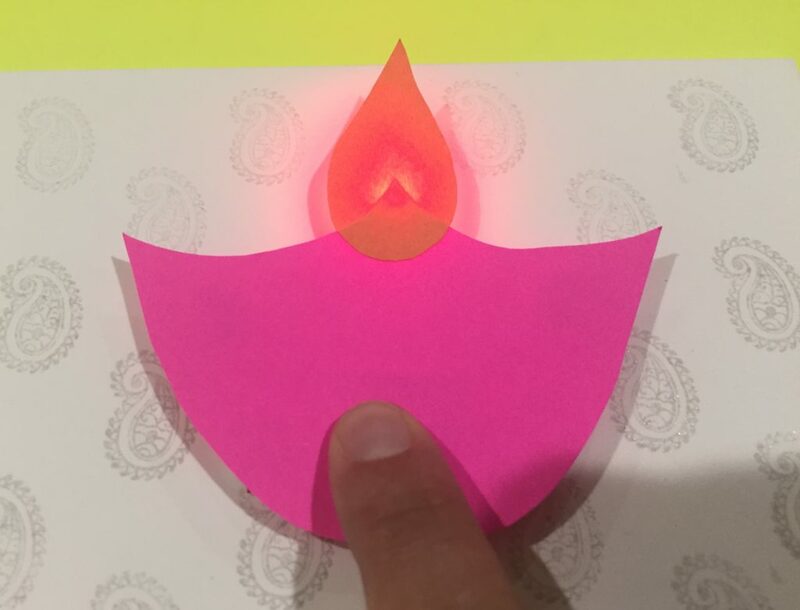 Here is a craft inspired by an ancient Indian festival celebrated by more than a billion people, “Diwali”. Popularly known as “Festival of Light” is one of India’s biggest and most celebrated holiday of the year. People decorate their house and light up rows of small clay lamps called “Diyas” which symbolize the triumph of light over darkness and good over evil. 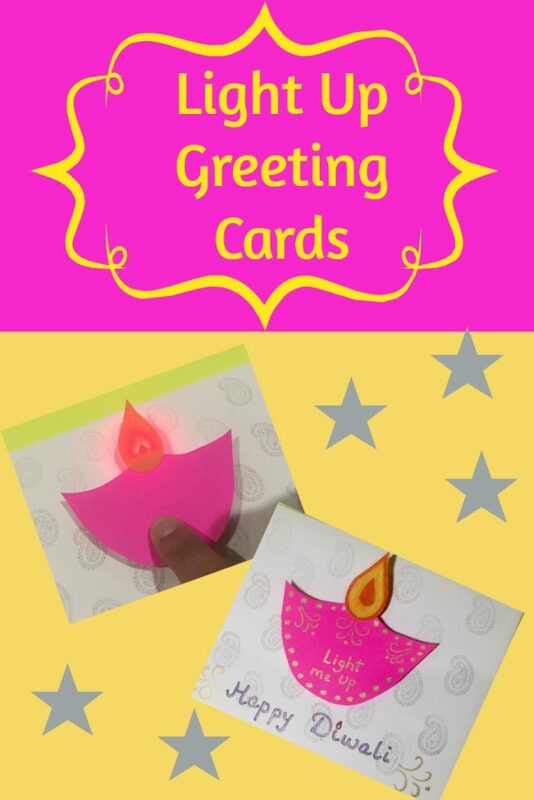 We created a simple paper circuits to light up our greeting cards. Fold the colored paper in the middle to make a card. 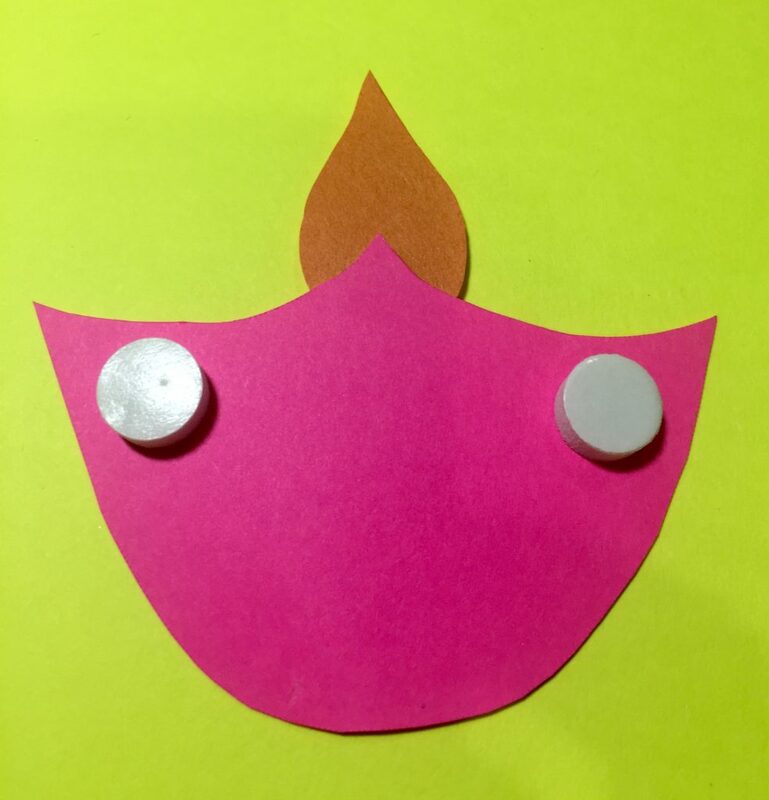 On the other cardstock, trace the design which would light up when you press the “Light Me Up ” switch. Cut out the design. Here, I have created a Diya, which is lighted up during the Indian festival Diwali. Trace the design on the aluminium foil. 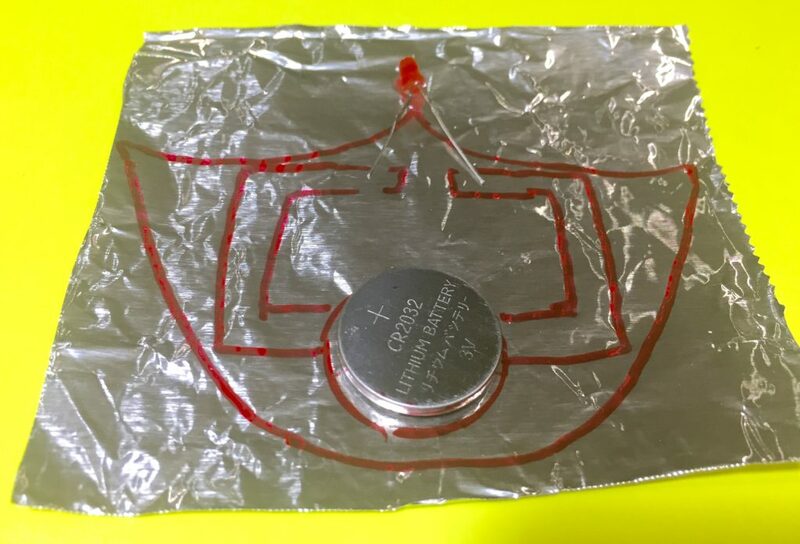 Create a circuit with a sharpie as shown in the picture. Trace the battery with a circle and mark the place where the LED would go. Make sure your design is such that the whole circuit can be hidden behind it. 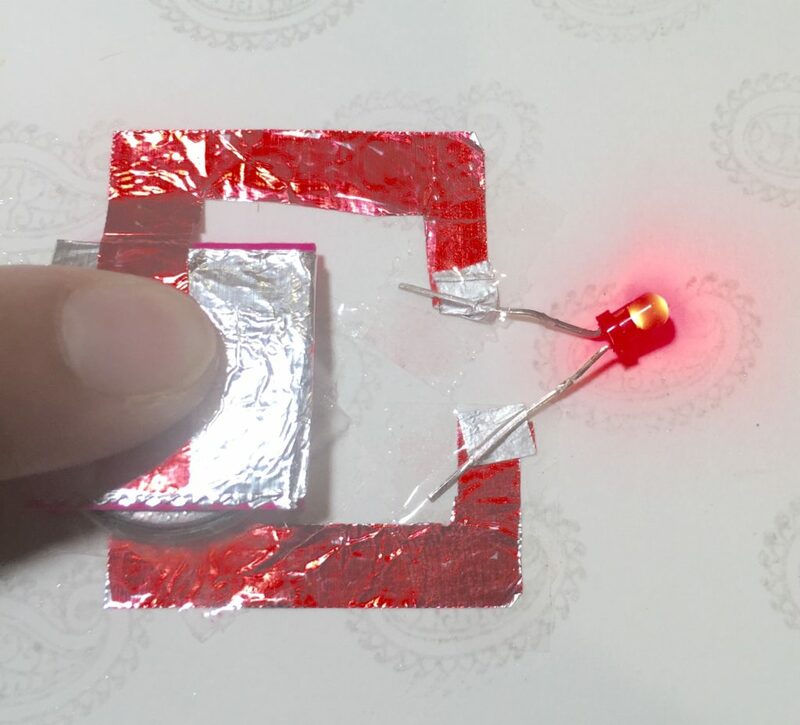 To create a simple paper circuit, you have to make sure one end of the first foil strip connects the positive side of the battery and the other end connects to the positive wire ( the longer one ) of the LED. Similarly, the second foil strip should connect the negative side of the battery with the negative wire of the LED. This would make a complete circuit. 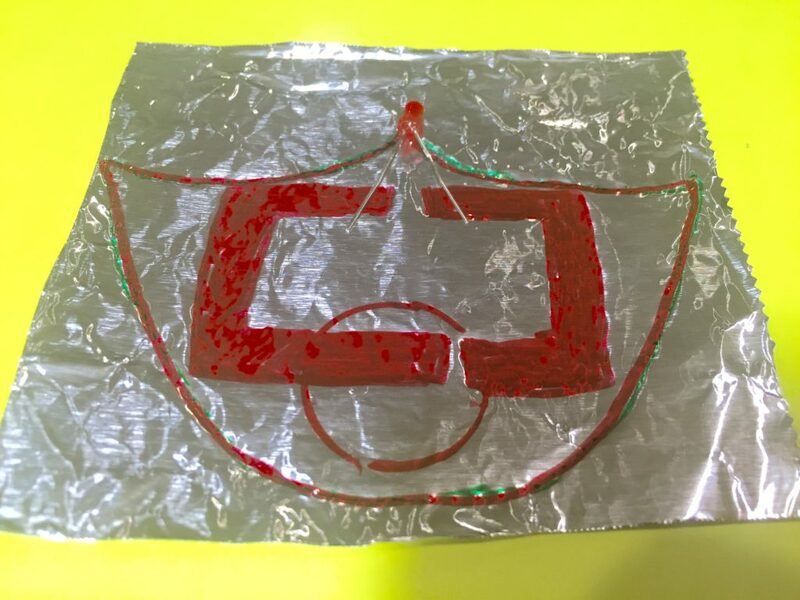 You must be careful not to allow the foil from either side to touch each other, as this will short the circuit and the LED won’t work. 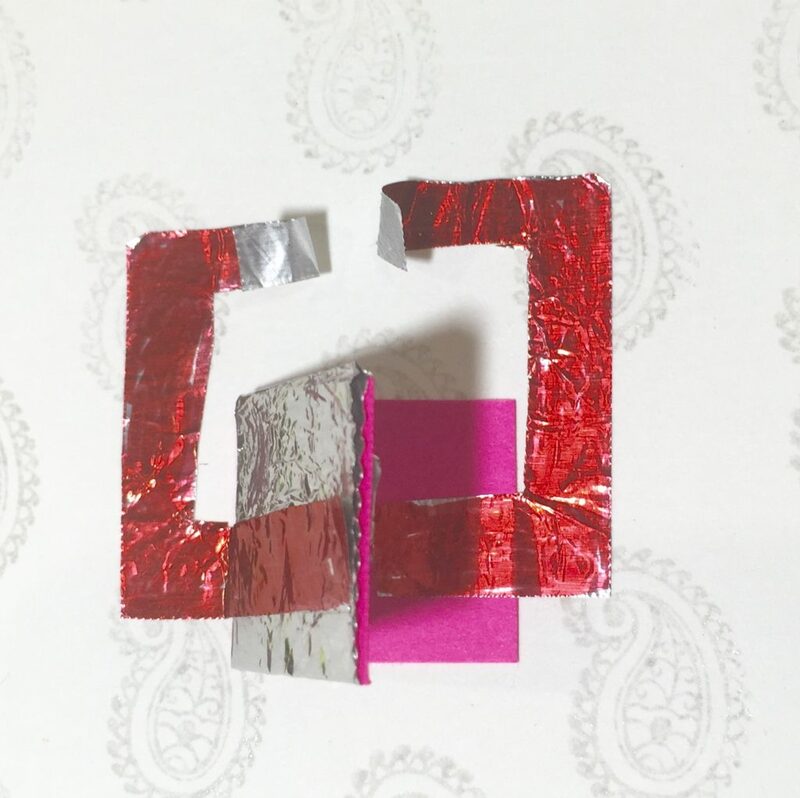 Cut a small rectangular piece from the cardstock and fold it in half. Glue one half part of the rectangular piece on the card where the battery would be placed. Cover the other part with aluminium foil. This will act as a switch to complete the circuit when the “Lit me Up ” button is pressed. 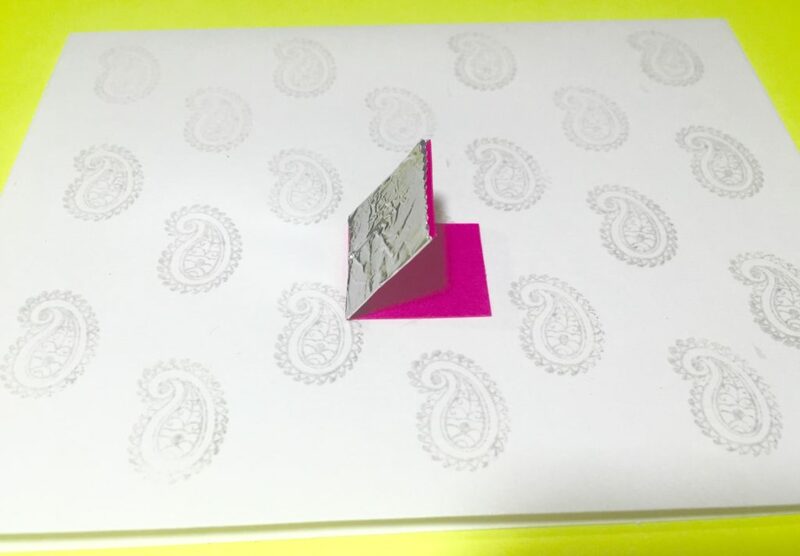 Cut out the foil strip along the solid line and glue it on the card. Leave the ends where the LED would go, apart so that they can be wrapped around the two wires of the LED. Also, one of the foil strip will be glued on the flap of the switch which is covered with the aluminium foil. Tape one end of the LED wire to one of the foil strip and the other end to the other strip. 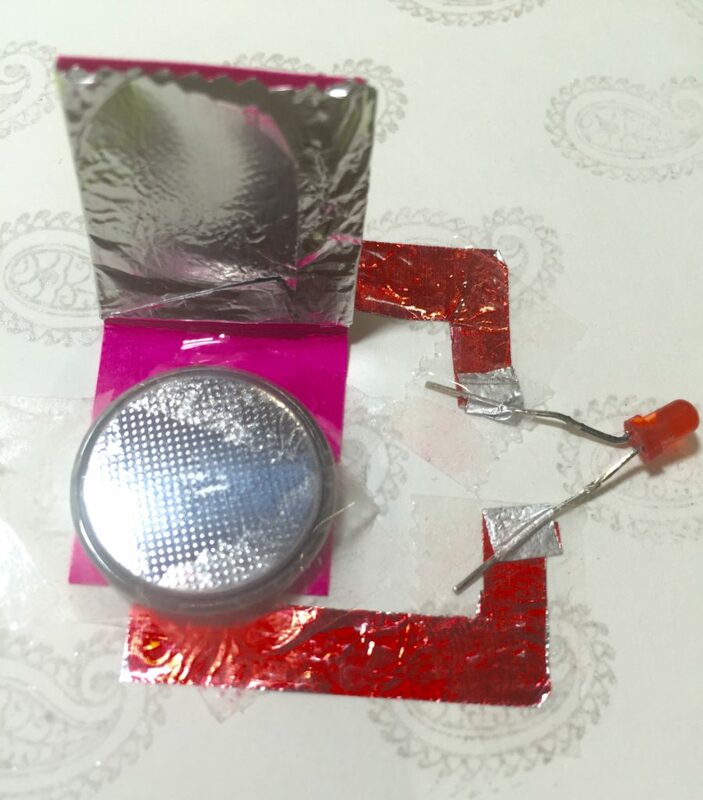 Place the battery and check if the circuit works by pressing on the flap of the switch ( the rectangular cardstock which is covered with the aluminium foil ). The LED should light up. If it doesn’t, then try flipping the battery upside down. Tape the battery, along the side, making sure it has a good contact with the foil when the switch is pressed. There should be no tape between the battery and the foil. You have made a simple circuit. 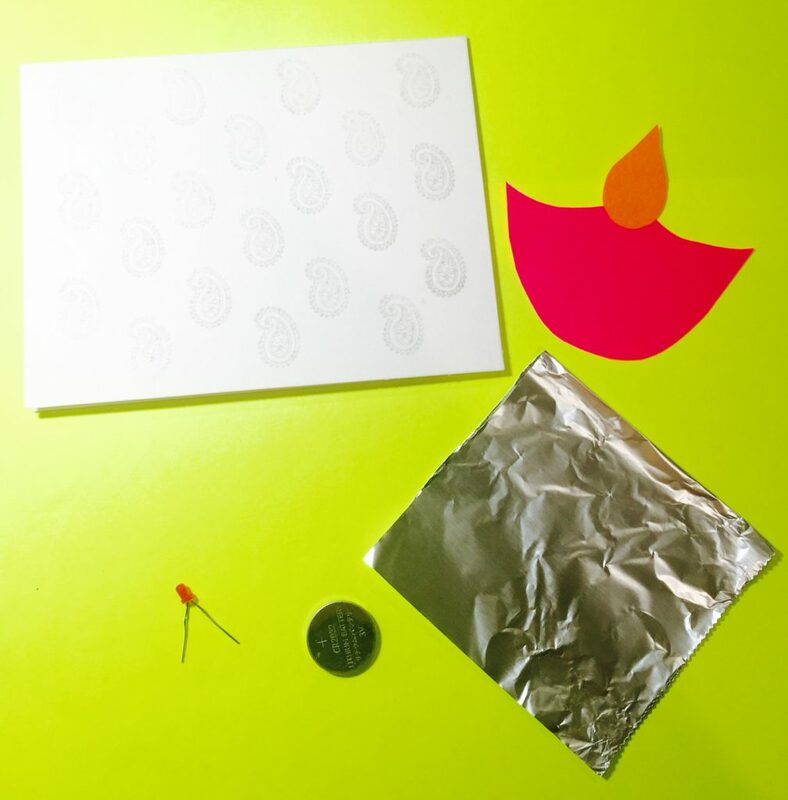 Since aluminium foil allows electricity to flow, a current is created when the charged particles move from the battery through the LED and back to the other side of the battery forming a closed connection. 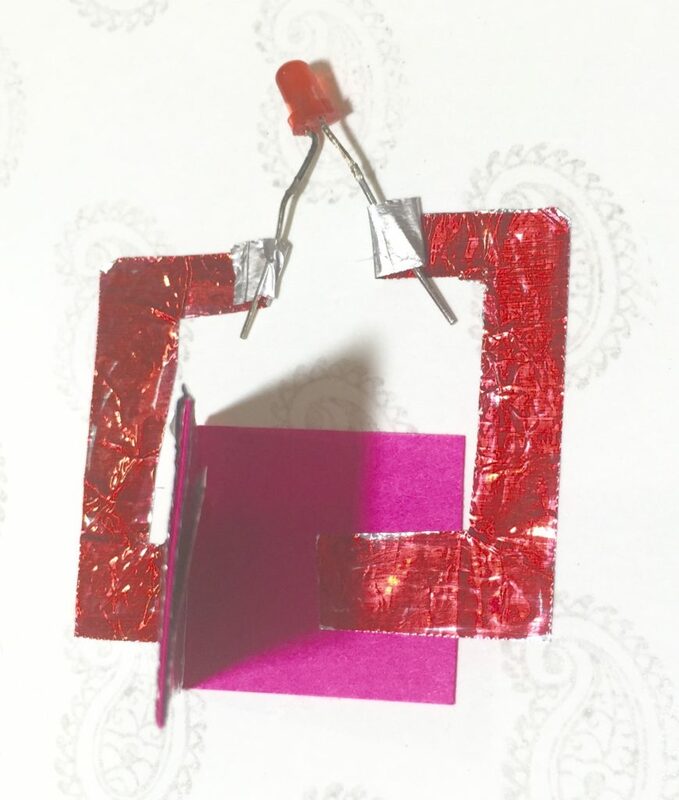 Since the battery would be a bit bulky, you can elevate the design using glue dots or by creating an accordion fold using two pieces of scrap paper and gluing it behind your design. 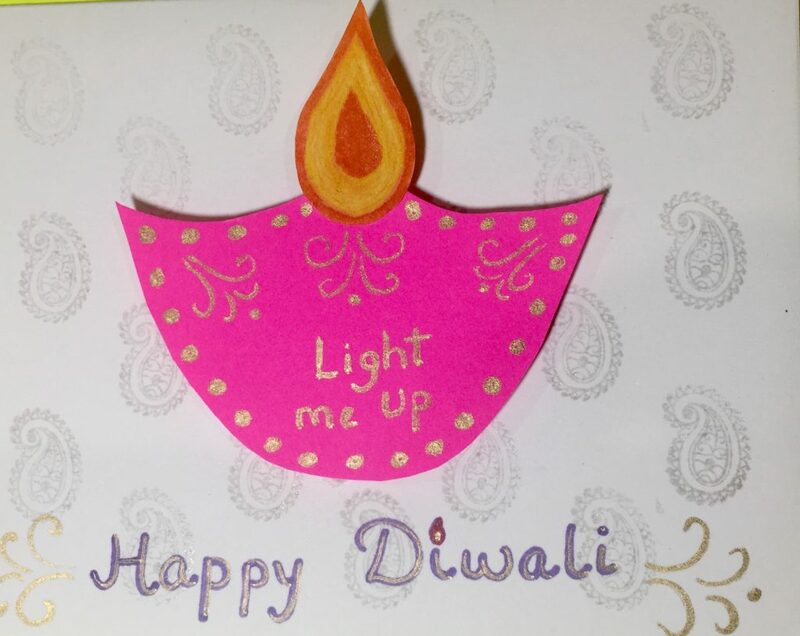 Place the design onto the card such that it covers the circuit and the LED is behind the flame and the place where you would write “Light Me Up” is at the right place. Secure it with tape and glue, making sure the circuit is working. Decorate your design with colored markers and write a beautiful message on the card. Give it to someone to brighten up their day ! Happy Diwali ! These are so very cute! What a wonderful idea. Thank you! This are so cute! Seriously such a great idea!